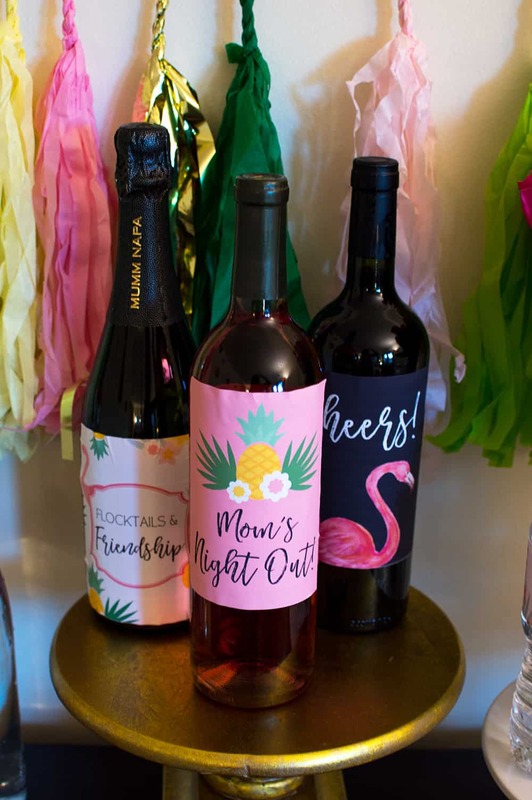 I’m pretty sure the flamingo and pineapple trend isn’t dying anytime soon, so let’s enjoy some wine, it’s time to Flamingle for Mom’s Night Out! 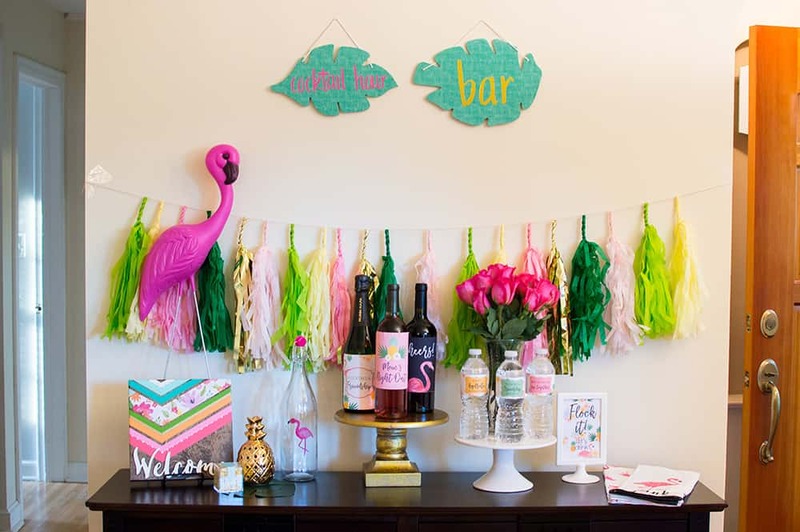 Today I’m sharing a Flocktails and Friendship party, a little tagline that I’ve come to love. This party is actually from last Summer, and I’m finally getting around to sharing it with you! Read on for all the details and decor finds. There’s nothing better than getting together with other Moms, especially when they have children of similar age and are truly in the thick of it along side you. When my oldest was born I took a new mom class at a local center that provides birthing and early childhood classes. 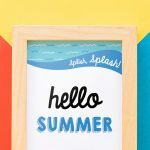 It was probably the best thing I did for myself as a new mom as I learned a ton of information but more importantly made amazing connections. When my second came along I didn’t hesitate to sign up again, and the deal was even sweeter as the class was focused on bringing home baby #2 (or even #3), and we’ve kept in touch as our kids turned 1, 2, and now we creep closer to age 3. Sometimes we’ll head out to dinner or an activity, but for this gathering I hosted at my home. Sometimes the best nights are getting together at someone’s home, enjoying some drinks and apps over conversation. 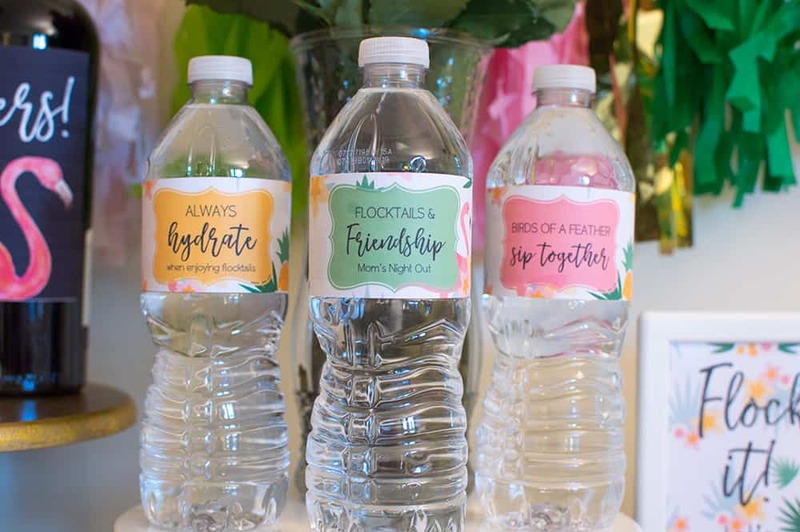 I recently shared another party with mom friends, so if you haven’t checked it out yet, don’t forget to pop over to see all of the Crown Thyself Party brunch ideas. I love a big display right when you enter my home, so I decorated my console table to welcome the ladies to my home. I started by hanging “Cocktail” and “Bar” signs on the wall. Many of you might remember these signs at Target in their Bullseye’s Playground, aka the Dollar Spot, last year. I also used them at a 60 Flocking Rocks party earlier in the Summer. 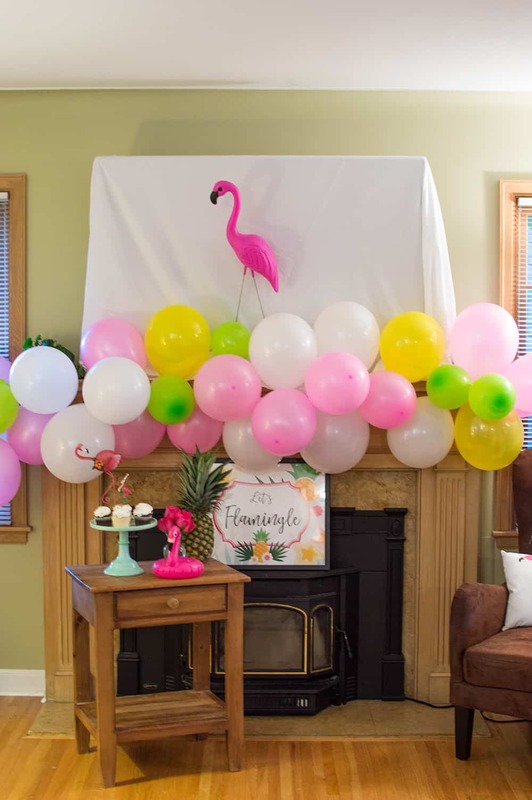 A tissue tassel bunting from GlamFete on Etsy and a fun flamingo prop from Oriental Trading finalize the backdrop. 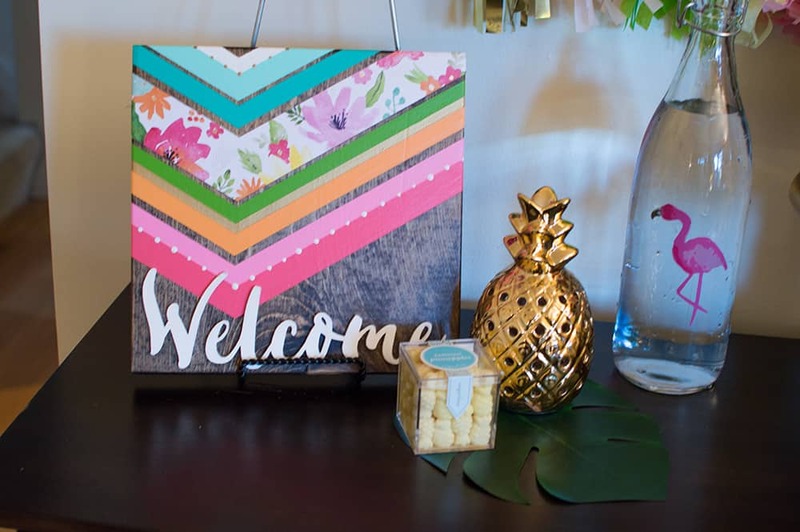 This wood Welcome sign from The Spotted Chevron usually sits right in my entry way, and I thought the bright colors matched the vibe perfectly. My home is mainly neutrals, so I love when I can add in a pop of color. Be sure you sign up for Ebates before online shopping at Etsy and Oriental Trading. Both offer cash back on your purchases and if you sign up with my Ebates referral link, you’ll receive some extra cash back! I love cake stands and have accumulated quite the selection over the last few years. I picked up this gold one at Hobby Lobby when I was planning a St. Patrick’s Day party. I get excited each time I use it because it looks so regal. On top I displayed a few bottles of wine that were spiffed up for the occasion with custom wine labels. 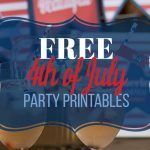 Printables are so easy to include in your party and really take it up a notch for a cohesive look. The white cake stand is another Dollar Spot find. While this is no longer available in stores, there are other options including this one from Target or snag this versatile one from Amalfi Decor. Always hydrate when enjoying flocktails. Birds of a feather sip together. Other little decor items include a ceramic pineapple, flamingo carafe, and some fun dish towels. It’s always a good idea to shop your home for items that can complete your look. 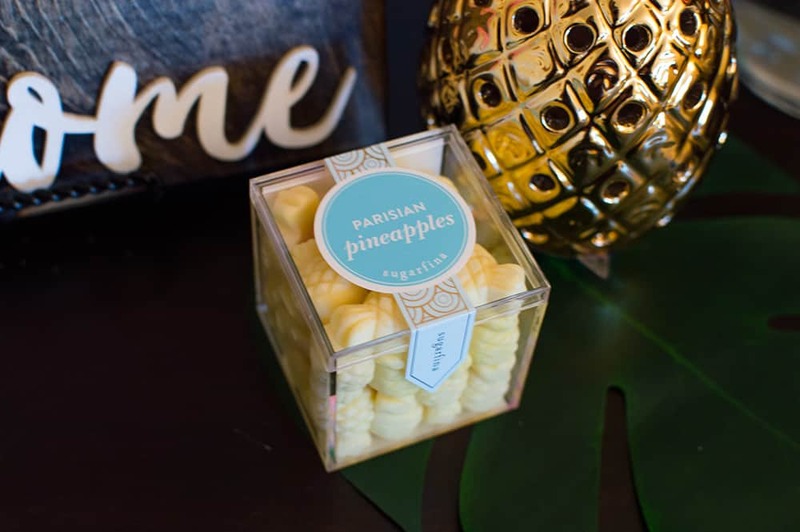 Don’t forget some sweet treats, these Sugarfina pineapple candies are the perfect complement and make a cute take-home favor. 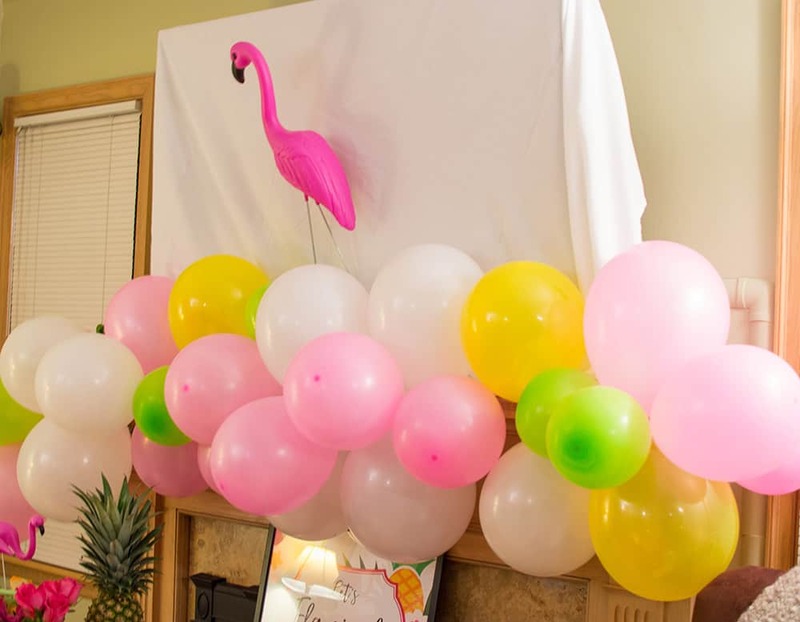 Balloon garlands are so fun and easier than you think. I’ve been getting better at them since my earliest attempts, like this orange and black one for Halloween. My favorite one to date is one I put together for my son’s puppy party. I think the key is to get different sized balloon, something I didn’t have the chance to do here, but attempted by blowing up the balloons with less air. Get the mini balloons, seriously they work best. Sprinkles & Confetti is a great source for mini balloons. This pink set would work great! Don’t forget a balloon pump and balloon strip to make the process easier. 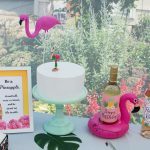 I added a 16×20″ sign, which I had printed at Costco, and used a bedroom side table as a little stand to display some cupcakes and other festive items like a pineapple, roses, and a drink float. The one pictured is from Target but this set at Oriental Trading (which I also own!) is also perfect. Finally, the tablescape completes this party look for my flamingle Mom’s Night Out. In the heat of setting things up (on a week night) and preparing for arrival, I didn’t get the best photos! Bummer! 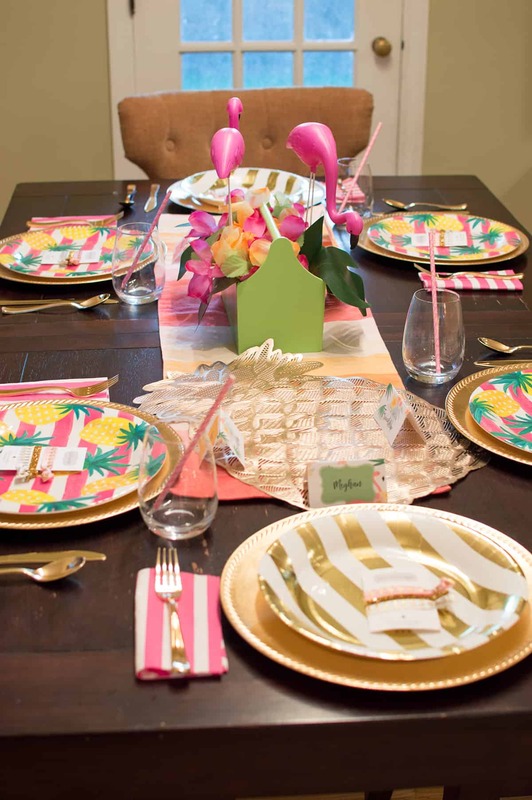 Start with a color block table runner and tape the smallest flamingoes to the inside of a colorful box tray. Fill the box with some Hawaiian leis. These were leftover from a party earlier in the year and came in handy for my event! 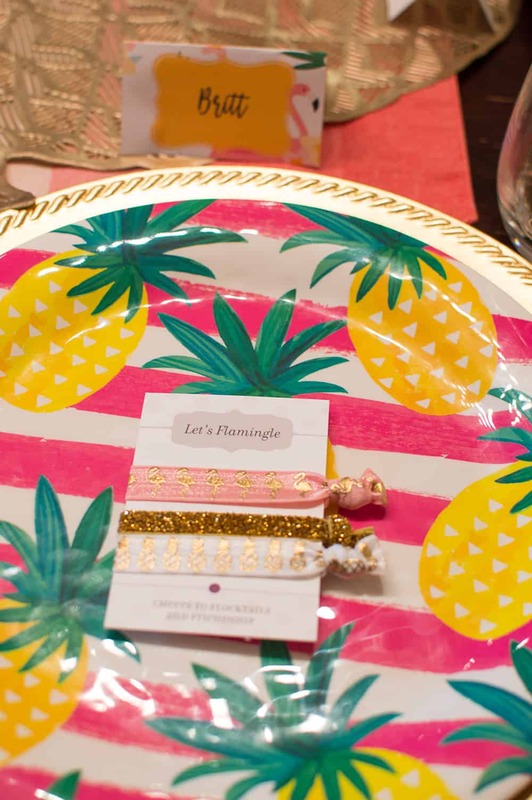 For the place settings I started with some gold chargers, and layered on some cute pineapple plates that I found at Home Goods. These hair ties are so cute and make another fun favor. You can find this flamingo and pineapple set I’m using on Etsy. The best part is Plum Polka Dot will customize the little card for you. However, if you need something fast, you can get this non-personalized flamingo set or this pineapple set on Amazon Prime. To keep it simple, each of the ladies brought an appetizer or a dessert to share. We drank a little wine, ate some good food, and shared mommy war stories and advice. It’s pretty wonderful to have such an awesome tribe of warrior mamas to enjoy flocktails and friendship with. 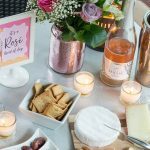 If you’re looking for other ways to celebrate with your best ladies, you might like this Girl Gang Galentine’s Day Party or this Girls Gone Glamping party.